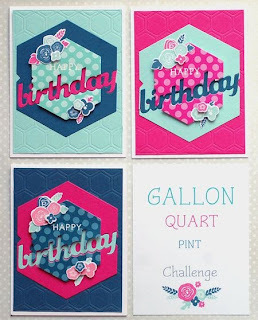 There was one challenge over at Papertrey Ink's Stamp-a-Faire that really caught my attention. I'm aware of the gallon:quart:pint color theory, but I don't usually make a deliberate point of using it. So this challenge was really a good brain builder! So the idea is to pick three colors; one color is used the most, the other is used next, and the last color is used the least. I used the bold teal, deep yellow, and pale green. Pattern papers are from Studio Calico "Sundrifter". I used Hero Arts inks in "Butter Bar" and "Tide Pool". The stamps and dies are Papertrey Ink "Bubble Talk". Nice birthday cards!! Love how you used the different colors. You could make tons of these and use up lots of papers!! 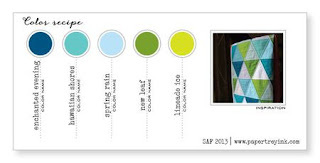 That second card is FAB - love the colors and design!! Ooooooh, I love this one to! Great colors and you did a great job with the challenge! I think this card perfectly fits the GQP rule. 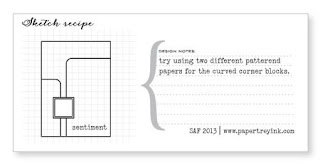 Add to it the fun and oh-so-trendy papers and stamps, and the literal "flow" and it's an exemplary design.